Chords are combinations of three or more notes from a scale that form the harmony of a song when played together. Chords are often used by piano players and guitarists to accompany singers or instruments playing a melody line. A lot of sheet music comes in piano/vocal editions, which includes the lyrics of a song, chord diagrams (for guitar) and chord notation for pianists. 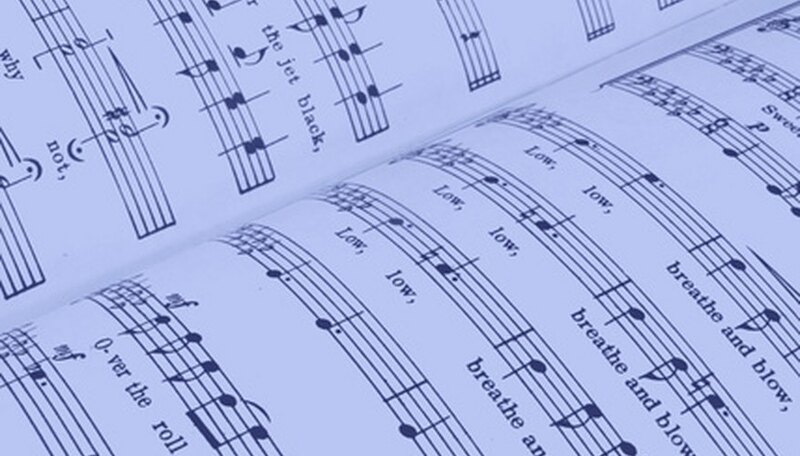 The way you decide to read the chords on a piece of sheet music often depends on the instrument you play and your level of skill reading music. Open a piece of piano/vocal music. You'll see the music staff for piano, which will include the treble and bass clef. Look at the treble clef and you will see notes on the staff written one after the other and some that are written on top of one another. Notes written on top of one another should be play together. These combined notes are chords. Not always, but in most cases, you can identify the name of the chord by the lowest note. Read the notes in the bass clef. In some piano music, most of the chords are written here, while the treble clef notes usually form the melody or the melody complemented by chord tones. This means you will see a lot of stacked notes in the bass clef, especially in more advanced piano sheets. Play chords from the chord diagrams if you aren't proficient at reading music notes. Almost every piano/vocal sheet has chord diagrams written over the music staff, with the diagrams placed at the location in the song where the chords change. Chord diagrams in a song are meant for guitar players in most instances, written in a diagram that represents the neck of the guitar and shows guitar players where to place their fingers to make the chords. A piano player can simply read the chord name and play it if he has memorized chord shapes. Some sheet music omits the guitar diagrams and the chords are written by name: C or Cmaj for a C major chord, Cm for a C minor chord, C7 for a seventh chord, Csus for a suspended chord, etc.